The Polis Center at IUPUI, in partnership with the IU Richard M. Fairbanks School of Public Health and the Richard M. Fairbanks Foundation, released the results of a new study which illuminates the relationship between tobacco outlet density and tobacco use in Central Indiana’s most vulnerable populations. 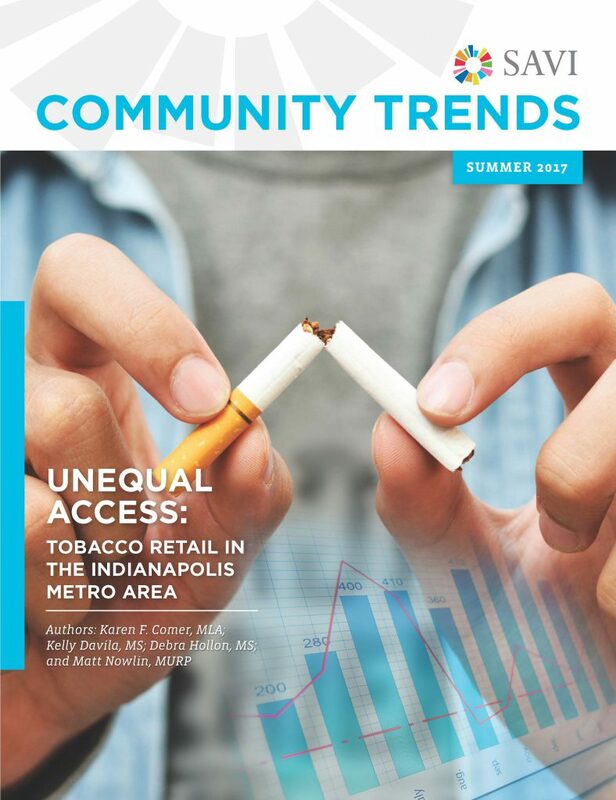 Entitled “Unequal Access: Tobacco Retail in the Indianapolis Metro Area,” the study’s findings were publicly released at a presentation and panel discussion at WFYI Public Media. Panelists included Bryan Mills, President and Chief Executive Officer of the Community Health Network, Claire Fiddian-Greene, President and CEO of the Richard M. Fairbanks Foundation, Dr. Virginia Caine, Director of the Marion County Public Health Department, and Dean Halverson. The implications of this research are significant. It opens new avenues for improved tobacco policy and gives communities the ability to focus resources where they are needed most. The full report can be found on the SAVI website.